Click on product for further details. 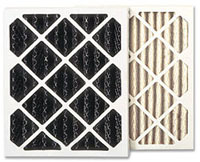 "Odor Ban" filters are specifically designed for the removal of fumes, odors, pollutants and dust particles. Remove odors from cooking, new paint, new carpet, bathroom smells, cigarette and cigar smoke, pet odors, etc.